If you were waiting for Archie Comics to update Josie and the Pussycats like they've done with Archie and Jughead you won't have to wait much longer. In fact, you can rest easy knowing that the first issue by Marguerite Bennett, Cameron DeOrdio, and Audrey Mok is as fun and funny as you'd hoped it would be. It probably has the most in common with classic Archie books than the other reboots. You can't go wrong with this new series. As expected the first issue covers how the band gets together, playing for the first time, and introduces all the characters. It would be a pretty by-the-numbers introductory issue were it not for its rapid-fire wit and dialogue. Bennett and DeOrdio quickly establish the setting and develop the characters in amusing ways that distinguish each of them right off the bat. Melody steals the first issue hands down. Audrey Mok creates a frenzied fun expressive adventure from Josie's solo act to forming the Pussycats. The influence from manga is evident but with Mok's own touch. Andre Szymanowicz's vibrant colors add energy to an already kinetic sequence of scenes and close-ups. It's so appealing and pretty to look at you can't take your eyes off the page. These modern day shenanigans are a great tribute to the Josie and the Pussycats stories of the past. 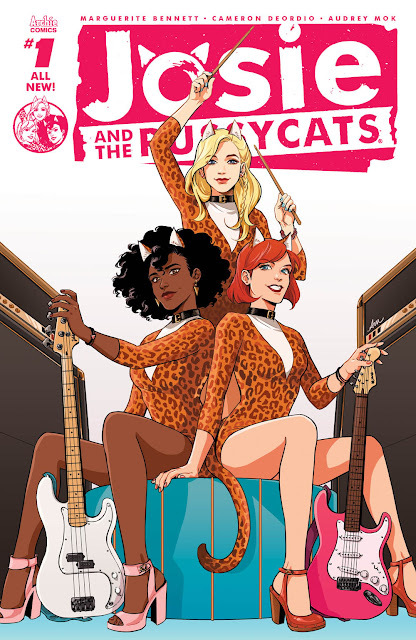 'Josie and the Pussycats' is an unbridled joy to read. It may be the most fun series of the New Riverdale era and that's saying something. 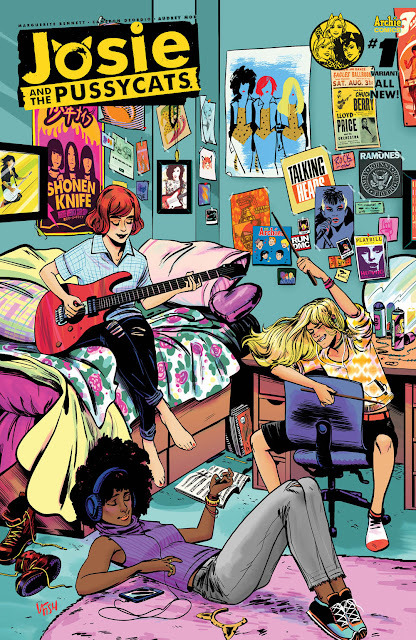 With art this good and characters this entertaining, 'Josie' is a winner. Script: Marguerite Bennett and Cameron DeOrdioArt: Audrey Mok, Andre Szymanowicz, Jack MorelliCover: Audrey MokVariant Covers: Derek Charm, Colleen Coover, Veronica Fish, Francesco Francavilla, Robert Hack with Steve Downer, Gisele Lagace with Shouri, Alitha Martinez with Kelly Fitzpatrick, Marguerite SauvageBlank Sketch Variant Also AvailableOn Sale Date: 9/2832-page, full-color comic$3.99 U.S.